I played Pilotwings about four years ago, a SNES flight sim with some unusual craft and an interesting set of missions – a bit simple now, maybe, but impressive for the time and with a fair amount to do. As you can see, the Nintendo 64 got a sequel, although it took fifteen years for another follow up. It feels like this game has less options than its predecessor, despite its increase in technology. We’ve lost skydiving and replaced a light plane with a gyrocopter. In the mean time, the areas in which the missions take place has grown, feeling more suitable for the platform and giving more interesting worlds to play with. The controls are quite tricky – made for the N64 controller, but it still doesn’t always transfer well. There’s something in the way it feels delayed that the game works against you in places. It doesn’t add that much challenge, though, just awkwardness to do things like making the turns correctly or being able to dive just right, but that’s also because the game doesn’t always need it. The missions aren’t impossible, but finishing them in time, while landing properly, is. You need to get enough points between the missions to continue to proceed. Per level, they always take place in the same area, just for the three different modes, and they soon feel hard. You need to keep trying and improve until you manage to get there… Something that got me to the third level or so, but keeping up became a bit much after that. 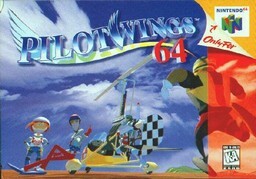 While the controls let it down, Pilotwings 64 provides a decent challenge with some nice missions in a world that looks better than its predecessor. It misses a bit of that game’s simplicity, but they both hold up quite nicely.